Mike Kelley arranged these found, handmade figures in much the way that specimens would be ordered in a laboratory or displayed in a natural history museum, highlighting the museum's role of collecting, preserving, and displaying. By using a prescribed framework to organize cast-off personal artifacts, Kelley reveals the cataloging of objects as a portrait of vested interests and cultural mores. Black-and-white photographs of some of the figures hang on adjacent walls, reminiscent of both mug shots and typological photographic projects like those of the German photographers August Sander and Bernd and Hilla Becher. 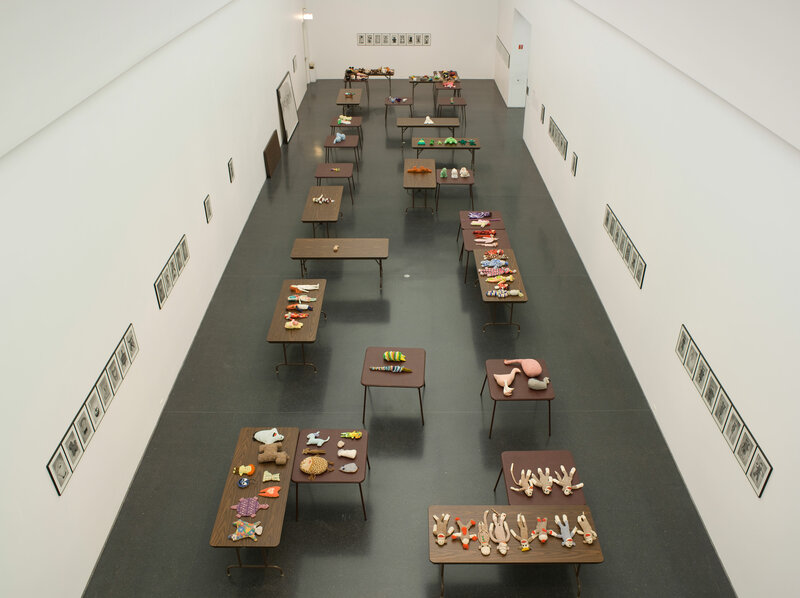 Even when Kelley used a clear system for grouping types of toys (as with the table of sock monkeys), each object is markedly different from the next, revealing the limits of the makers' skill and their aesthetic and cultural biases. What may previously have seemed like a simple toy becomes a marker of social context and exchange. "Craft Morphology Flow Chart." Take It or Leave It: Institution, Image, Ideology Digital Archive. Los Angeles: Hammer Museum, 2017. https://​hammer.ucla.edu/​take-it-or-leave-it/​art/​craft-morphology-flow-chart/​.